Introduction: Several studies have reported a correlation between antral follicle count (AFC) by 2D modality and anti-Mullerian hormone. However, few studies have reported a comparison between 2D modality and 3D SonoAVC AFC measurements. Objective: To compare the total AFC using 3D SonoAVC with 2D modality. Materials and Methods: We included 50 infertile women presenting to a private fertility clinic between January and May 2018. AFC was measured on day 2 or 3 of menses. The scanning was performed by transvaginal ultrasound using 2D and 3D technology. Results: Statistical analysis demonstrated that both modalities were equivalent. Although AFC was higher using 3D SonoAVC as compared to 2D modality (mean difference of three follicles), the difference was not found to be statistically significant (P = 0.184). Conclusion: SonoAVC is a promising tool for AFC measurement in infertile women and is comparable to 2D AFC measurement. Modification of technology and post-processing can further improve the accuracy. Prediction of ovarian reserve is one of the factors in determining the success of an assisted reproductive technique [ART] treatment. In addition to the age, AMH (anti-Mullerian hormone), antral follicle count (AFC), follicle stimulating hormone, oestradiol (E2) and inhibin B are useful markers for ovarian reserve testing. Introduction of high-resolution ultrasound has substantially changed the approach to ART practice. Traditionally, AFC was measured by 2D modality. However, there is inter and intra-observer variability in 2D measurements, and it is prone to human errors of recounting and misidentification. SonoAVC (Automatic Volume Calculation; GE Medical Systems, Zipf, Austria) is a software which uses 3D ultrasound modality for automatic identification and counting of antral follicles. It identifies structures which are hypoechoic compared to relatively hyperechogenic surrounding ovarian tissue. Some authors have validated 3D ultrasound technology for AFC measurements. The aim of this study is to compare conventional 2D modality with newer 3D SonoAVC technology. We included 50 infertile females between the ages of 20 and 45 years. All of the participants attended a private fertility clinic between January 2018 and May 2018. Baseline scan was performed on day 2 or 3 of menses, using Voluson S8™ [GE Healthcare, Chicago, Illinois, USA] machine and a high-resolution transvaginal probe. Manual 2D AFC count and 3D AFC count using SonoAVC modality were noted for all the patients [[Figure 1]]. For 2D measurements, ovaries were spanned from one end to the other end, and total AFC were counted manually through eye-balling. Whenever in doubt whether to include or exclude a follicle, the measurement was performed in two dimensions. For SonoAVC, a 3D volume was taken first by putting a box over ovary, just sufficient to cover an entire ovary without including much of extra-ovarian structures. Once the option of SonoAVC is clicked from a sidebar, an automatic image is generated with all the follicles pictured in different colour. Post-processing was performed wherever needed to include an antral follicle or to exclude an extra-ovarian structure. Report was generated automatically which included not only diameters but the volume of each and every follicle with individual colour coding. All measurements were taken by a single operator trained in advanced ultrasound to avoid inter-observer bias [[Figure 2] and [Figure 3]]. Statistical analysis was performed using IBM SPSS Statistics for Windows Version 23.0 (IBM Corp, Armonk, New York, USA). The mean number of total AFC using both 2D and 3D SonoAFC was generated. Independent sample t test was run to evaluate the statistical significance of mean difference in number of follicles detected between two methods. The mean total AFC count using 2D method was 14.5 ± 9.8, whereas the mean total AFC count using 3D SonoAVC was 17.6 ± 12.9 [[Table 1]]. On an average, SonoAVC measured AFC was 3.1 counts more than the 2D modality, but this difference was not statistically significant (P = 0.184) [[Table 2] and [Figure 4]]. Management of ovarian reserve is a critical step in patients who present with infertility. In addition to chronological age, AMH and AFC are the most useful markers for ovarian reserve test. It has also been suggested that AFC alone may suffice as a test for estimation of ovarian reserve. AFC, by transvaginal ultrasound (TVUS), measures follicles ranging from 2 to 9 mm in early follicular phase of menstrual cycle. Traditionally, it was measured using 2D modality of ultrasound which can possibly have intra and inter-observer variability. The aim was this study was to compare 2D and 3D SonoAFC methods for measurement of AFC. The results of total AFC count using 2D and 3D modality were noted in 50 infertile women who presented to a single infertility clinic. Our findings suggest that both the modalities are comparable for measurement of AFC count. 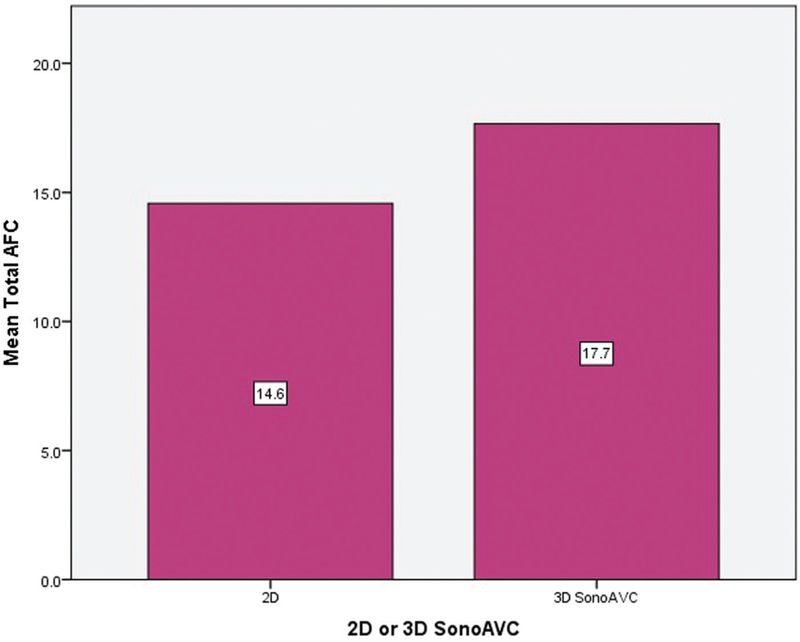 Although total number of AFC detected were more in 3D SonoAVC technology, the difference was not found to be significant compared to the 2D modality. There are several studies identified in literature on the same topic, and most of them had similar results. Traditional 2D AFC counts either overestimate or underestimate the actual follicle count, particularly when there are a large number of follicles. It has been suggested that 3D volume acquisition improves diagnostic efficiency when used in various applications in obstetrics and gynaecology. Fagundes et al. concluded that 3D technology can measure more follicles than 2D, especially in ovaries with more than 20 follicles as in polycystic ovarian syndrome [PCOS] patients. Nylander et al. suggested that in an overweight PCOS population, 2D TVUS underestimates AFC as compared to 3D TVUS. In their study, the correlations between AMH and AFC from 2D TVUS, 3D TVUS and magnetic resonance imaging were 0.67, 0.78 and 0.70, respectively (P < 0.001). Ata and Tulandi in their review article suggested that the SonoAVC technique provides reliable and highly reproducible results under a variety of conditions. Another study by Deb et al. found that automated SonoAVC is significantly quicker than AFC measurements, using 2D ultrasound imaging (mean ± standard deviation, 132.05 ± 56.23 vs. 324.47 ± 162.22 s; P < 0.001). In addition, in contrast to our findings, they reported lower number of antral follicles by SonoAVC as compared to 2D modality. Vandekerckhove et al. showed that SonoAVC software had excellent accuracy. There was no significant difference in clinical outcome and pregnancy rate when this technology was used, but significant advantage was found in the time gained. Moreover, stored images offered the possibility of quality control and standardization. They suggested that ovarian reserve testing by SonoAVC was highly reliable. We acknowledge that there are pros and cons of using 2D and 3D technology. Disadvantage of using 3D SonoAVC technique is instrument’s cost, operator’s expertise and experience. While taking 3D volume, the box has to be appropriately placed to avoid extra-ovarian structures and vessels which can hamper the accuracy of AFC measurements. Post-processing has to be used appropriately to avoid over or under measurements which in turn depends on operator’s skills. Advantage of using 3D SonoAVC is more when AFC is more such as in case of PCOS, and we can store images for further review and post-processing. Our study had a few limitations. Although AFC and AMH have been reported to have a strong correlation, inclusion of comparison between AMH and 2D AFC or 3D AFC in the present study could have added to the strength of the current evidence. This was just a cross-sectional observational study, and we did not follow-up with the pregnancy rate and outcome of these patients. Moreover, we did not measure the time taken to perform 2D AFC and 3D SonoAVC AFC measurements. Further studies correlating clinical outcomes would add significantly to current body of literature. The result of this study concludes that for AFC measurements, both the 2D and 3D SonoAVC modalities are comparable. Automated AFC can be used reliably for AFC measurements where facilities of 3D modalities are available. Peres Fagundes PA, Chapon R, Olsen PR, Schuster AK, Mattia MMC, Cunha-Filho JS. Evaluation of three-dimensional SonoAVC ultrasound for antral follicle count in infertile women: Its agreement with conventional two-dimensional ultrasound and serum levels of anti-Müllerian hormone. Reprod Biol Endocrinol 2017;15:96. Jirge PR. Ovarian reserve tests. J Hum Reprod Sci 2011;4:108-13. 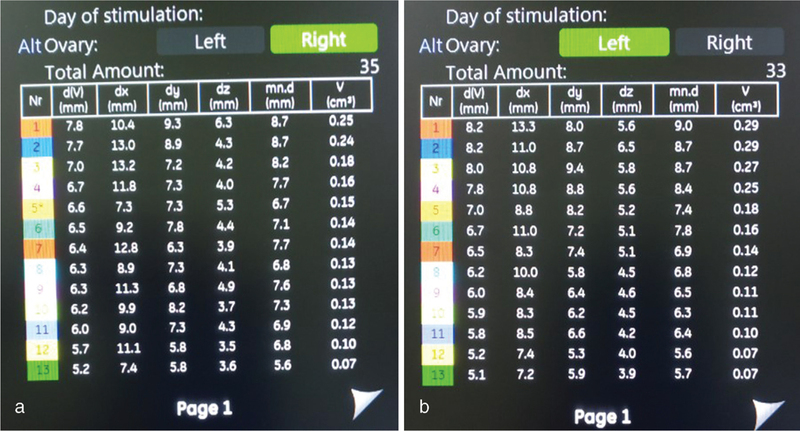 Panchal S, Nagori C. Comparison of anti-Mullerian hormone and antral follicle count for assessment of ovarian reserve. J Hum Reprod Sci 2012;5:274-8. Raine-Fenning N, Jayaprakasan K, Clewes J. Automated follicle tracking facilitates standardization and may improve work flow. Ultrasound Obstet Gynecol 2007;30:1015-8. Benacerraf BR, Benson CB, Abuhamad AZ, Copel JA, Abramowicz JS, Devore GR et al. Three- and 4-dimensional ultrasound in obstetrics and gynecology: Proceedings of the American Institute of Ultrasound in Medicine Consensus Conference. J Ultrasound Med 2005;24:1587-97. Nylander M, Frøssing S, Bjerre AH, Chabanova E, Clausen HV, Faber J et al. Ovarian morphology in polycystic ovary syndrome: Estimates from 2D and 3D ultrasound and magnetic resonance imaging and their correlation to anti-Müllerian hormone. Acta Radiol 2017;58:997-1004. Ata B, Tulandi T. Ultrasound automated volume calculation in reproduction and in pregnancy. Fertil Steril 2011;95:2163-70. Deb S, Campbell BK, Clewes JS, Raine-Fenning NJ. Quantitative analysis of antral follicle number and size: A comparison of two-dimensional and automated three-dimensional ultrasound techniques. Ultrasound Obstet Gynecol 2010;35:354-60. Vandekerckhove F, Bracke V, De Sutter P. The value of automated follicle volume measurements in IVF/ICSI. Front Surg 2014;1:18.